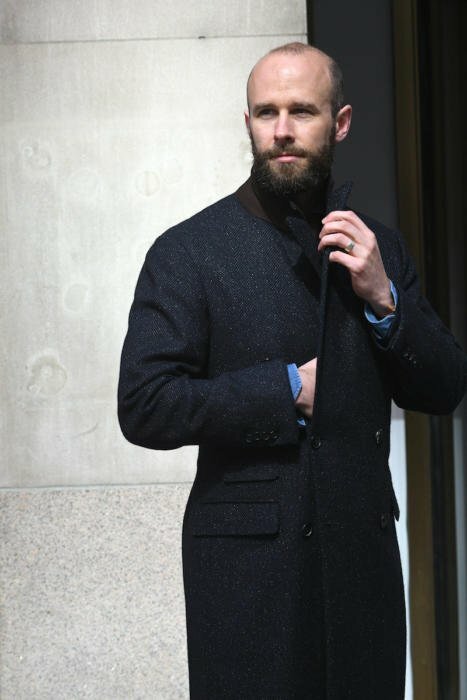 In some ways, this navy jacket and topcoat from Ettore de Cesare are the antithesis of the Disguisery tweed jacket we featured last week. Ettore is a third-generation Neapolitan tailor known for his close-fitting, unstructured garments and leather work. 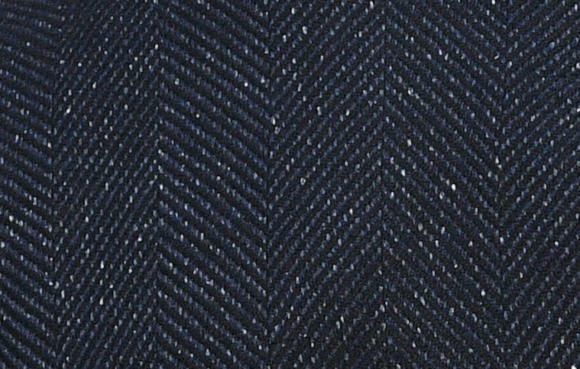 The jacket - in a hopsack-like open-weave cloth from Holland & Sherry - is relatively short, small-shouldered and completely unpadded. Other than a touch of roping at the end of the shoulder, It makes no effort to make me look bigger or stronger. The contrast between it and the Disguisery tweed should be interesting, therefore, for readers evaluating where on the spectrum of size and structure they prefer to sit. Readers may also understandably ask why I have jackets made in such different styles. Partly it is the interests of the blog. 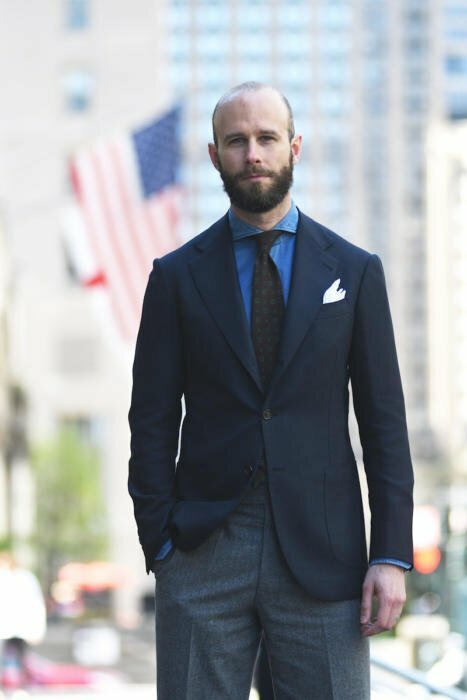 I want Permanent Style to be a reference for all styles of tailoring, and that requires pieces made by a variety of tailors in their rough house style. But in reality that is a minor reason. More important is the fact that I just enjoy different styles of tailoring. I enjoy, in the same way, finely welted bespoke shoes, chunky cordovan boots, and simple, chic sneakers. There are limits (all have points of quality and style in common) but the range is still fairly wide. Of course, I will also wear these pieces of tailoring in different ways. I am more likely to wear English tailoring at a smarter occasion, with smarter accessories. I am more likely to wear a Neapolitan jacket with an open-necked denim shirt and slip-ons. Ettore has not had much attention online as a visiting tailor, which I think is partly due to his tendency to bright colours/designs, and partly that so much of his clientele is in Italy - Naples and Milan. However, the quality of the work is very high - and he offers something genuinely different in his familiarity with leather and suede. The workshop was founded by his grandfather, who had trained at Rubinacci, in 1960. Ettore initially learnt tailoring at his grandfather's knee, working after school as many in Naples do. I'm in Naples next week and will report back on Ettore's workshop, as well as those of many other Permanent Style favourites. The fit of the pieces Ettore made for me was very good in the fundamentals - but required a few changes, both functionally and aesthetically. Both were made without any padding in the shoulders, just canvas. But at the first fitting, the shoulder line was perfect, the balance perfect, and both back and chest very clean. It was the work of someone that - I learnt - is used to working off a single fitting. Because when Ettore returned to London, both pieces were finished. This wasn't what I expected, but as the fundamentals were right it just meant the changes would be a little harder for him to make - requiring more seams to be unstitched. As I was travelling to New York the following week, and shooting with Karl-Edwin Guerre of Guerrisms, I took the two pieces as they were and had them photographed. The latter two points perhaps illustrate how Ettore naturally cuts a jacket - what might be called his house style. And it's useful to have imagery of those things for anyone considering using him. The coat, by contrast, was perfect from the off. That same clean fit in the chest and back, and neither waist nor sleeve too tight. It is double breasted, with a dark-brown suede undercollar, ticket pocket, dark-brown horn buttons and a half-belt in the back. The back of the coat has a full-length pleat, tacked just behind the belt - which itself has been made in the style I originally used on my Vergallo loden coat, with two buttons at the fastening points to allow it to be tightened when worn without a jacket. This system has worked very well on the loden, and so far on this navy DB. It helps that the coat already has some fullness in the back gathered into the belt, as tightening it just increases that gathering. It also helps that it is a relatively soft, lightweight cloth. I'd pick out that cloth separately as something I love about the coat. It is a 400g wool/cashmere mix - so very lightweight and soft for a coat - and has a beautiful black herringbone pattern over a mix of navy and white/grey flecks. It is produced by Scabal, but unfortunately exclusively for Ettore - so it is available only through him. As a top coat, the dark colour will make it a great piece to wear with smarter outfits - suits or at least smart trousers, black or dark-brown shoes - in warmer weather than a regular overcoat. 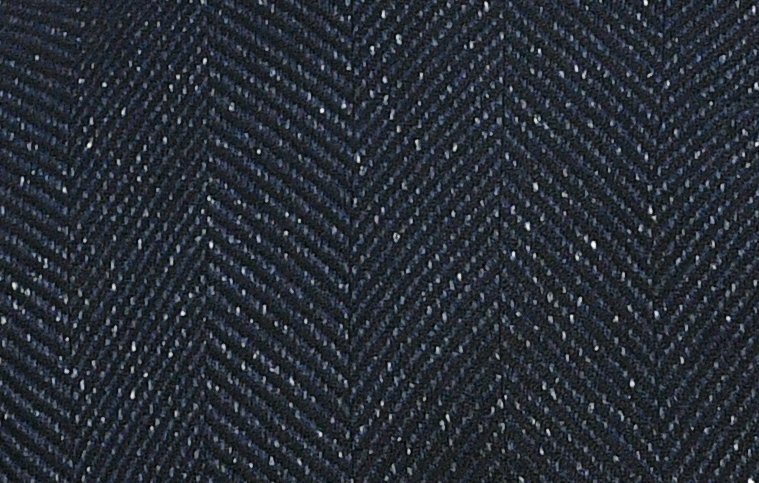 The jacket's cloth also deserves a mention, as it is an open-weave wool that is extremely lightweight and breathable - but not a hopsack. It is from the Mesh Blazers 1730 bunch at Holland & Sherry, which was new this year. The bunch has five different blues, plus a big range of bright summer colours. Nine ounces, woven in Huddersfield. As to the suede, I was keen to make use of Ettore's experience here but in a small way to start with. So we just added suede to the undercollar of both pieces - dark brown for the coat, mid-brown for the jacket. Both are subtle details, but ones that I really like. The mid-brown on a blazer, in particular, is something I've always loved on Loro Piana jackets, but been unable to replicate bespoke. The suede is beautifully soft, and neatly worked. It also helps support the collar when it is popped up. Ettore's suits start at €2300 - so great value - with this jacket costing €1800 and the coat €2600. He travels regularly between Milan, Naples and London, but not elsewhere. He is in London roughly every 4-6 weeks, and is next here in September after the summer break. Usually fittings and finishing can be done between each visit, so 2-3 appointments would be necessary for a suit. More likely to be three for a first-time customer. He can be contacted on ettore@ettoredecesare.it. You can follow the discussion on Ettore de Cesare – Neapolitan summer blazer and top coat by entering your email address in the box below. You will then receive an email every time a new comment is added. These will also contain a link to a page where you can stop the alerts, and remove all of your related data from the site. Beautiful! The soft structure might not add as much shape as the Disguisery jacket, but it’s got a youthful elegance to it. It’s a matter of taste of course, but I find very strong structure in an odd jacket to limit its range of uses. And, like tightness in a leather jacket or a tshirt, a bit can be flattering, but too much risks looking like one is trying too hard. The coat is magnificent. 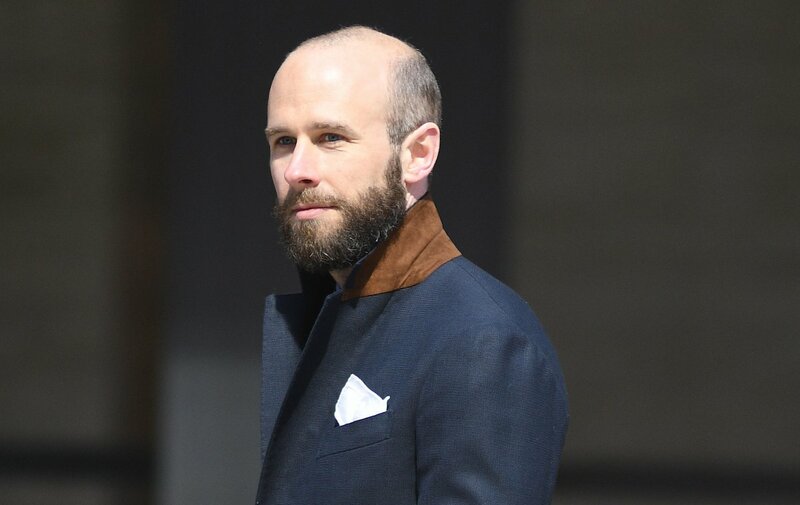 How do you feel about such light wool in adverse weather—London in the Spring, say? I agree on the structure. On the coat, it’s fine really, you just end up wearing more layers – a jacket and knitwear, for example. But generally I would suggest a heavier weight if you don’t already have 2-3 nice coats. Hi Simon, Ettore did a great job especially with that coat. I like it! And your cloth choice is perfect in my opinion. But about the jacket… I prefer you with more relaxed cuts: this is too tight, but this time too I like your cloth choice: I actually fell in love with Mesh Blazer, I have the Royal Blue one and I recommended it to all my friends for a summer blazer and so far have all given positive feedback. Will you have the jacket lengthened by 2 cm? Can it be easily done? I think the coat looks like a really useful piece, hopsack being a great cloth for an informal look but something which can also easily be dressed up. Fully agree that it is way short on you, and 2cm would not only fix the length but lower the button stance, which is also too high given the current proportions. The overcoat looks great. Roll on winter!! So the tailor lengthened it from the shoulder? How do they even do that? 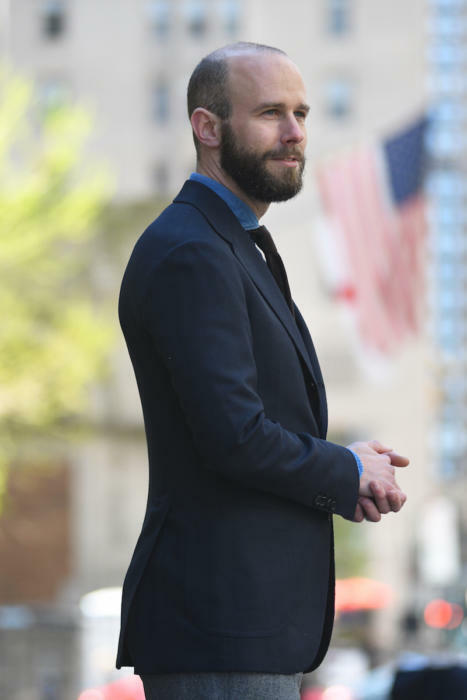 I discussed with Russel at GB about lengthening a jacket with 3/4 inches (ie 2 cm) due to it by mistake being too short by that much, and he said it could easily be done from the hem. This was especially as the button position was placed based on the correct lenth of the jacket at the forward fitting stage. Would you recommend me taking Russel’s advise here? It may just be the light in the first photograph, but the front darts seems very conspicuous even though the cloth is plain, and the line jars with the patch pockets. This is a fairly common problem with front darts; personally I dislike them in any patterned cloth, particularly plaids, where the pattern becomes distorted. Very few tailors seem to go for the option of concealed darts to overcome this problem. Overall though, this is a nice jacket, and I agree about the length being too short and the waist a little tight, exaggerating the curvature of the back. I think the slim sleeves would look better without the roped sleevehead; perhaps that’s what give the effeminate look. The overcoat is gorgeous. Thanks. Yes, it’s just the light with the darts. The jacket is not you. Too tight,too short,button stance a bit too high…..etc. Also trouser leg,especially in thigh,seems a bit wide making the jacket/trouser combo look bottom heavy. This is a common approach to tailoring for many (young) tailors in Italy. It’s amazing how much difference structure can make when this jacket is compared to the one from the disguisery. This one makes you look skinnier, somewhat more youthful and perhaps a bit more contemporary and modern. The roping stops it from looking too casual. If there’s one thing I would change, is the length: it seems slightly short. 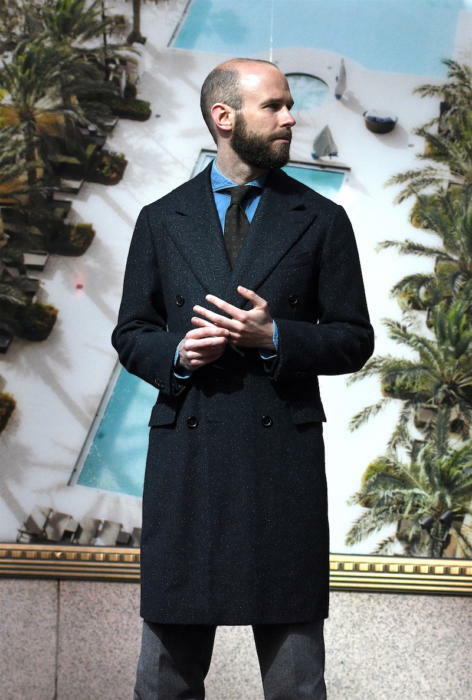 The disguisery jacket makes you look stronger, a bit broad chested even and more rough (as in masculine perhaps). Neither hides the your slopped shoulders, which I think gives a more natural appearance. The coat is a lovely thing indeed. Despite the short length and tight waist, the jacket still does look very nice — is the lapel size reflective of the tailor’s house style, or did you specify that size? The coat looks great, congratulations on another beautiful piece. Your wardrobe MUST be huuuuge!? How hard is it to lenghten a jacket that is allready finished? Particullary in the quarters? I posted that lengthening from the front of an SB is impossible, even though you suggested it was, but you haven’t put it on. You don’t like being challenged, do you? If you write tosh, expect to be called out Simon. As I write I am talking to Gigi Dalcuore about this point. It is possible if there is enough inlay, and there often would be. However, you make significant sacrifices to the size of the armhole. He would prefer never to do it, to start again. But he has done it in the past. And with this jacket, we did. You suggested to your reader that he could lengthen a jacket from the bottom if it was too short. You can’t. SB jacket construction means there is no inlay at the front, although there will be at the back. So you could lengthen from the bottom along the back, but not at the front, meaning you would ruin the balance. As discussed above, I have it from Russel at GB that there’s no problem to lengthen at a modest length of 2 cm if there’s enough inlay and the button position is already in the correct place. This is another question for you Simon: i’ve had jackets made in lengths (back) from 33 to 30 inches (and the one discussed above which ended by mistake at 29 1/4) but the button position is at the same place for all of them. The button is at my natural waist (where the natural “bend” is). Isn’t this the standard way to position the button? And wouldn’t this mean tha jacket length (within reason) is unaffected by the length of the jacket? The jacket reminds me Boglioli… Is it comfortable to wear? On your right shoulder, there is a gap between the rope and the upper arm, even when the arm is straight. I guess the sleeve is too tight there. But how can a tailor let a customer leave like that, I wonder? Good to know that the fit is right. But from an esthetic angle, does it not bother you? I find it unnice and it kind of reveals the trick of the rope. It’s not actually there when arms are fully straight, and any sleeve will crease as soon as you move your arms. I like the texture of the coat! 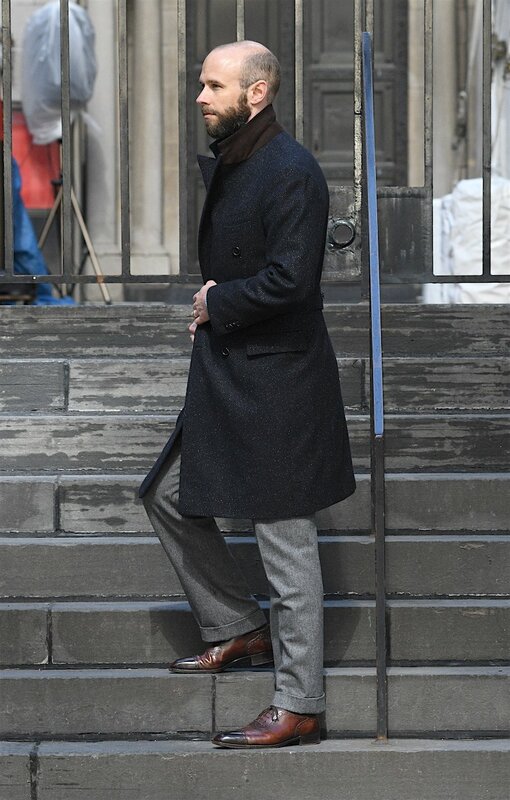 I thought I read earlier in your blog that you prefer coats to at least cover the knee. Thanks I think most of my Overcoats must be more for summer weather as none of them fall below the knee or are that warm! I’ll have to get a heavy weight one in something like this colour and texture something that can withstand a British winter! 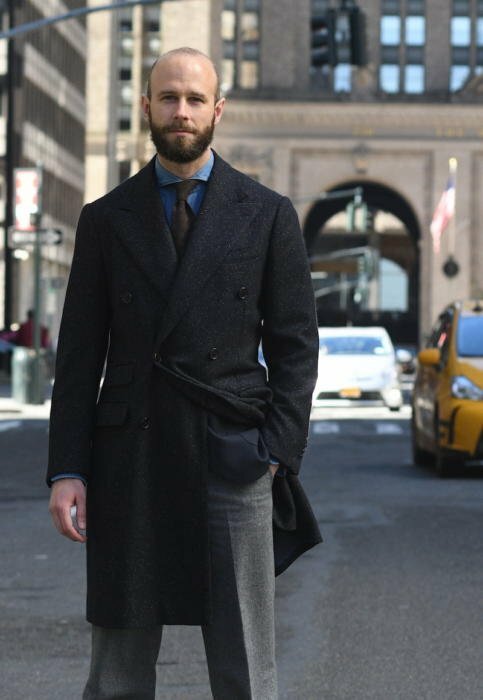 Would you recommend Ettore for a peacoat? Price is good value. Which fabric would you suggest for a casual look and to wear in Mediterranean winter (average temperature 10 degrees)? I would instinctively, but I haven’t seen over he had made. Check and ask for imagery. How does Mesh compare to Crispaire? 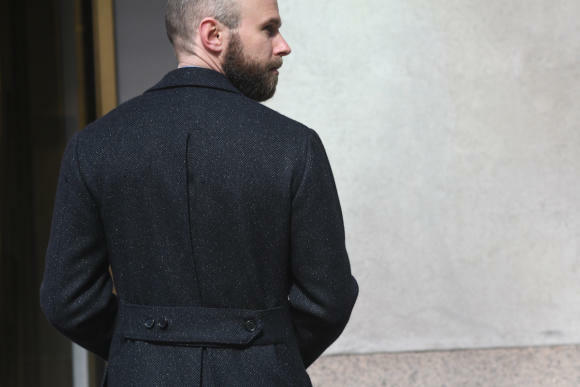 How do you minimize wrinkles on the back of suit jackets? I’m a big fan of your work, having been following and reading the blog everyday since several months,i know the blog content back to front 😀 and this is my 1st comment here ( I’ve been a silent non-interactive member,but an avid reader). I’m the head of the R&D dept at a RTW Suits company in India and reading your blog has been food for thought as i really love everything about bespoke in spite of working here at an RTW unit ( i get my clothes tailored, and your knowledge has seemingly streamlined my styling choices ). 1. The vents will fall exactly as they should, once the waist and eventually the hips are given more room. the buttoned area looks tight and i would not want to see the last one buttoned too, i can see it from here that it would make it very uncomfortable. It will be quite relieving if the tailor can fix that. and in the second case, a cotton jacket had shrunk a little after steaming , so he stitched a cut of fabric to the allowance to make the piece bigger (of the same curvature of the bottom front ,end to end and similarly strips in the back) thus increasing the length of the jacket and then stitched it together ,which isn’t visible now. ( clever people these Indian tailors are in matters of repair). But yes, someone with a keen eye can spot the faint edges in the bottom of the first fitting made prominent by final stage ironing and steaming. Thank you for all your knowledge and here’s blessing you with even more success, progress and growth! Cheers! Thanks, and nice to hear from. 1) Yes, as mentioned it is too tight here as I said. But I would never button the bottom button, and the jacket would never be cut to make this work. Really interesting to see how different the overall effect is from this cut! Saw you met Biagio Granata. Excellent young tailor. His cut is very similar to Cesare’s one. Je said to me he was working on a new pattern to give his parisians customer a more comfortable cut. Have you tried Santa Maria Shirts? Hi Mr. Cromptom, I follow his blog a long time ago and I write to him from Bogotá Colombia for the first time. Very nice that jacket, to see the second photo with the lapels above makes me curious and the impression of which is a fused jacket? I am starting a clothing business, offering bespoke and rtw service. In the process I have noticed that the quality of the fused has improved a lot, and I prefer logically with canvas but I have both fused and canvas jackets and I have not had problems with the fused and have a good body shape, I even found An overcoat of my grandfather who bought in Spain more than 32 years and for his age was in excellent condition except the lining where I could observe that it was built in a fused way and did not present problems of bubbles or detachment of the interlining. Well, I wanted to tell you this to retake the subject of the canvas vs fused suits, I think that just as digital photography has already exceeded the analogue or digital sound in front of the tape may be happening between the fused suits regarding the canvas suits . Thank you and many successes. Thanks. Fused construction has definitely improved a lot in recent years. Obviously that comparison is less relevant here as this is a bespoke jacket with a hand-padded chest – not something you can do with fusing. Have you done anything with that veritable Roman atelier, Sartoria Ripense? I performed a search here – to no avail. If you have not, what are your thoughts on commissioning something with the iconic Andrea Luparelli? I want to know how he stacks against some of the others in your opinion. What’s your view on the h&s mesh fabric? I’m considering having a jacket made in it? Does it hold its shape well? Is it cool? “Readers may also understandably ask why I have jackets made in such different styles. 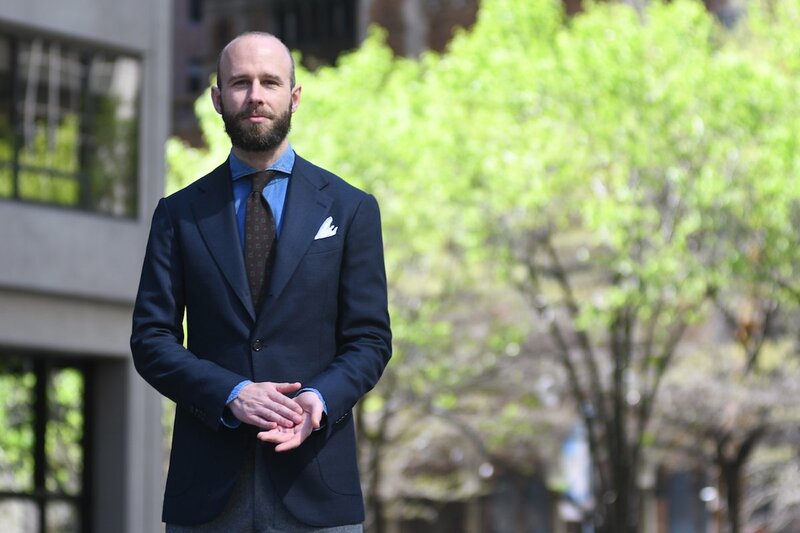 I’ve often wondered this as well, and how utilizing so many different tailors makes it difficult to define and refine your own personal style through a particular tailoring house’s own cut over repeated commissions (e.g., I tend to think of Alexander Kraft as being synonymous with Cifonelli). Do you find this is less of an issue within say Naples, due to the more shared similarities than differences of the many Neapolitan tailoring houses? Also I would really appreciate if you could suggest other good hopsack fabrics (e.g. fox brothers) from British Mill that I can use as I’m planning to create my first hopsack navy blazer. I wouldn’t focus too much on the mills – the hopsacks are pretty similar. Just make sure you get a weight you like and a navy that’s dark enough. In general, as I mention in parts of the guide to cloth, people focus too much on mills as brands and think they are all doing significantly different things to each other. That’s usually not the case.